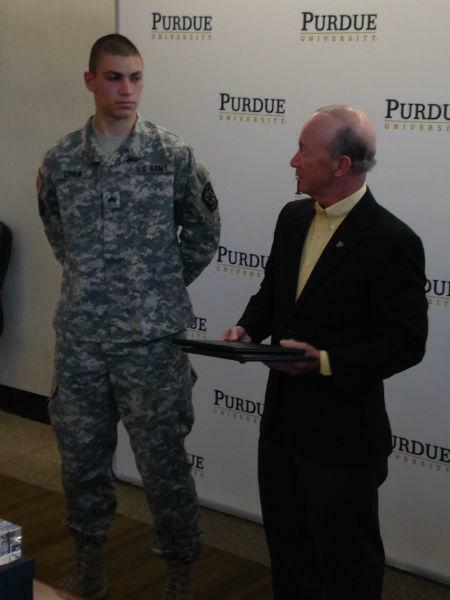 Purdue President Mitch Daniels took time Thursday to honor two men who helped evacuate residents from an off-campus apartment that was totaled by fire earlier this month. Daniels gave the school’s “One Brick Higher” award to sophomore ROTC cadet Greg Cohen and to 28-year employee Kevin Thedans. Both helped rescue people from the blaze, which took the life of 22-year-old Cody Day. Daniels says he talked with both men in the days leading up to the ceremony, and neither sought praise. A fire that destroyed a bar on the north side of Lafayette does not seem to be intentionally set. Although, officials say it’s still early in the investigation of the blaze at Brothers N Others on Sagamore Parkway North. The fire department responded to the call around 2:30 a.m. Friday. The business was closed at the time and no injuries were reported. A fire destroyed a nearby bar in September, 2010, as well. However, officials believe the fire at Cox’s Pub was intentionally set. Students and staff evacuated from Klondike Middle School around 11:20 a.m. Tuesday as the result of a fire. The blaze occurred in the school's technology lab, but officials do not yet know the cause. Authorities have said its clear for the students and staff to return to the building on Klondike Road in West Lafayette.